Germanium is a chemical element wi seembol Ge an atomic nummer 32. 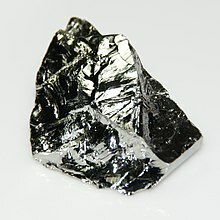 It is a lustrous, haird, grayish-white metalloid in the carbon group, chemically seemilar tae its group neighbors tin an silicon. Purified germanium is a semiconductor, wi an appearance maist seemilar tae elemental silicon. Lik silicon, germanium naiturally reacts an furms complexes wi oxygen in naitur. Unlik silicon, it is too reactive tae be foond naiturally on Yird in the free (native) state. This page wis last eeditit on 7 Mairch 2015, at 22:28.